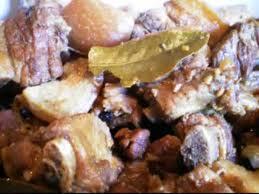 Adobong baboy na tuyo is just like the original adobo recipe we are used to, only that, this is the dried version. Adobo recipes have been part of the food culture of the Filipinos since time immemorial. The ingredient that is most needed or the most essential in this dish is the soy sauce or the “toyo”. Do you know that “toyo” really didn’t originated here in the Philippines? That Filipinos aren’t the one who discovered this wonderful condiment? Well, yes because according to history, Chinese really are the one who introduced to us the soy sauce, in exchange of our other spices. But the dish itself, the Adobo itself, really is an authentically Filipino dishbecause our natives are the one who invented it. Since then, this dish was popularly and regularly served during special occasions like fiestas, birthday parties, and some have it for ordinary meals. There is also lot of variations of this adobo recipe, including the dried version. There is the Batangas version (sauté the pork first before stewing), the Pampanga version (use salt instead of soy sauce), Laguna version (use sweet onions), Visayas version (add coconut milk) and other regions love to add sugar. Doing this dish won’t take much of your time because as you see, it is so easy to cook. So enjoy your cooking! In a pan, saute chicken liver and labuyo for 2-3 minutes and season withsalt and pepper. Remove from pan and puree (add little water if needed when blending). Set aside. In the same pan, brown the pork and add the garlic until fragrant. Add in the pureed liver and pour the soy sauce, vinegar, water, peppercorns and bay leaf. Simmer for 2-2½ hours until pork is soft and sauce has thickened. Garnish with spring onions and serve with rice.